Wild Black Cherries (Prunus serotina) are indigenous to the Eastern United States, Southern Canada, Central America, and Mexico and have a long history of use by Native Americans. This vegetarian product is a 10:1 concentrate and is one of the highest concentrations available. Gout Management, Osteoarthritis Relief, powerful antioxidant and anti-inflammatory properties. 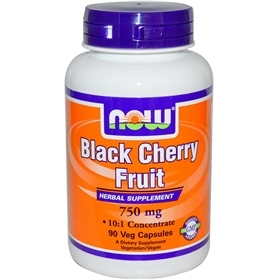 Black cherries contain two powerful compounds, anthocyanins and bioflavonoids. Both of these compounds slow down the enzymes which help to relieve and prevent arthritis and gout in the body. They are a rich source of antioxidants. They help prevent or repair the damage that is done to the body’s cells by free radicals. Queritrin is a flavonoid found in cherries, and has been discovered by researchers to be one of the most potent anticancer agents. Cherries also contain ellagic acid, a naturally occurring plant phenolic known as an anti-carcinogenic and anti-mutagenic compound that researchers say may be an effective nutrient to prevent cancer.